It was a funny scene for those who were there. Hours before Mayor Rahm Emanuel showed up for a major media event at the 14th (Shakespeare) Police District in Logan Square on Sunday, no fewer than six truckloads of workers from the city’s Department of General Services were on-scene fixing broken facilities and scrubbing the place to a high-polish. 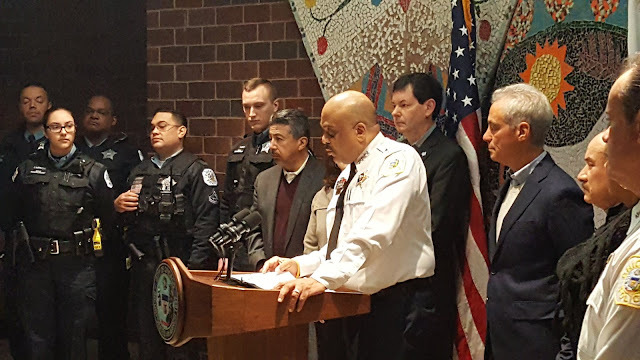 Emanuel arrived later to announce an anti-carjacking task force that will combine the efforts of federal agencies, Chicago and suburban police departments, and prosecutors. There will be a big powwow Monday at City Hall to iron out the details. Nobody seemed ready to point out that it has taken Emanuel five months to make a move against carjackings since we first identified the surge in September. Three months ago, even the slow-to-catch-on Tribune knew carjackings were out of control. Oh well. They’re going to try to put the genie back in the bottle now. We wish them well. Locations of the weekend's known carjackings and attempts. Meanwhile, at least three carjackings or attempts were reported in downtown this weekend. 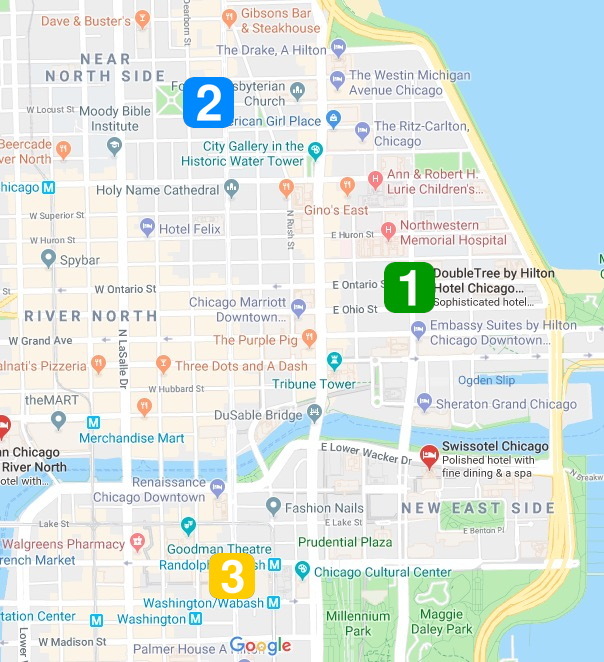 One resulted in an arrest after a witness pounced on the teenager who tried to take a car from a Streeterville hotel guest. On Saturday evening, an armed carjacker pistol-whipped a River North man and took his car at Dearborn and Delaware. The offender hit the man in the front of his head with a black pistol as the victim’s girlfriend looked on. The offender and a companion then climbed into the man’s Volkswagen Golf GTI and sped off. It happened just before 8 p.m. in an area that usually bustles with weekend traffic. Police said the primary offender is a slender black man who stands about 5’9” tall and has long dreadlocks. He was wearing blue jeans and dark clothing. A second man assisted in the carjacking. He was described only as black, about 5’9” tall, and skinny. Then, around 5:15 p.m. on Sunday, an Uber driver reported that a group of robbers entered his car and tried to carjack him at State and Randolph in the Loop. The victim had a paying passenger in the back seat. The driver did not surrender his car, but the team of four offenders got away with his phone and dashcam, police said. All five men fled northbound on State Street. The primary offender is black, about 5’8” tall, 160 pounds, and in his mid-20’s. He wore a black hoodie with red trim, blue jeans, and black boots. No further information was available about the other suspects.